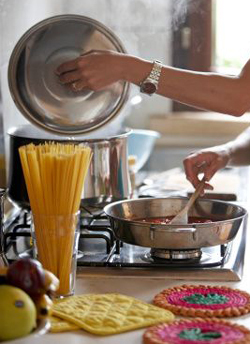 With 26 kg consumption per capita per year - at least a daily portion of 70 gr - Italians are the biggest pasta lovers. Venezuela is second with 12,3 kg and Tunisia third with 11,7 kg. Not only consumption, Italy is also leader in production figures with 3,3 millions of tons annually, second is USA with 2 millions of toms and third place goes to Brazil with 1,1 million tons.